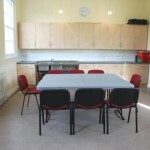 Hire the rooms and facilities of the Edward Richard Centre on an hourly, daily or weekly-session basis. We welcome booking enquiries from anyone who wishes to set up a special interest/activity group, run a class or hold an event. See website 6 parking spaces adjacent to the entrance; ample parking around, with a field available for larger events. 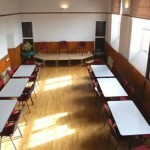 Upstairs room – set up as IT suite, with 8 computers, also available as meeting room with seating capacity 15; Fully equipped kitchen, with microwave and dishwasher; also Office suitable for small meetings. 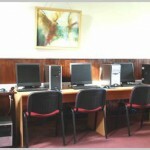 The Centre offers basic hostel facilities – two rooms are available for sleeping, with kitchen and washing facilities with shower; camping in tents in the grounds is also possible. 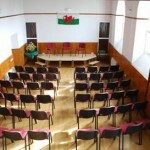 The location of the building also makes possible its use for private purposes – for example, quiet meetings, including meditation, or, alternatively, for music practice. Signage for the kitchen and toilets is also provided in braille.